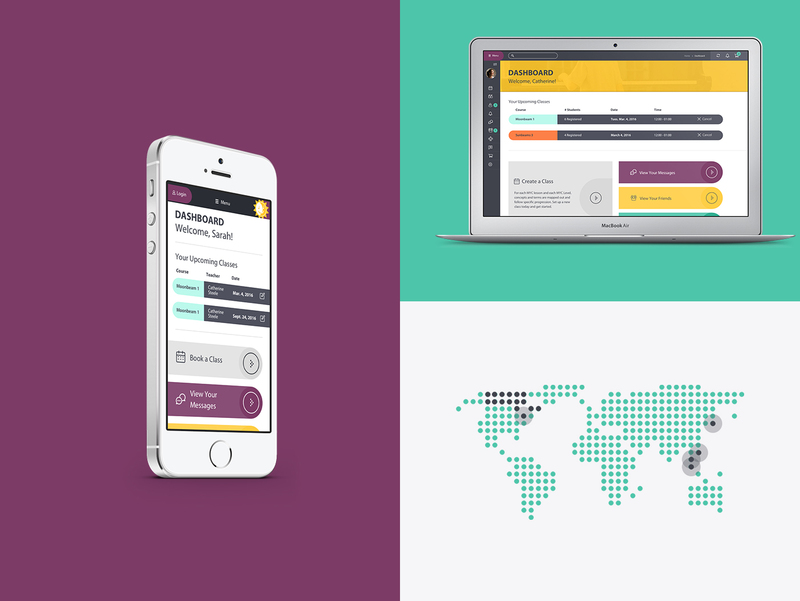 Our team was tasked with re-designing the MYC website and creating a partnering app and user portal. My role as senior designer was to create and lead the art direction for a new overall brand and establish the style guide for the website and app. 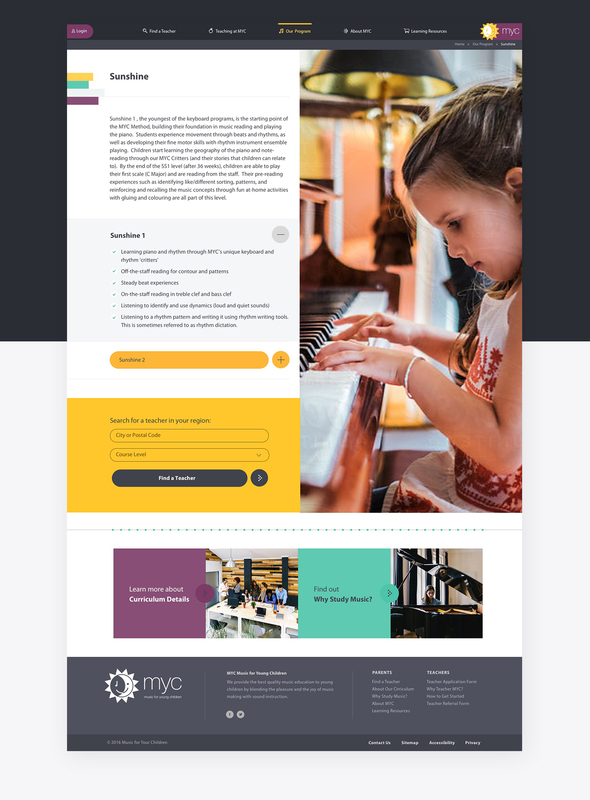 MYC (Music for Young Children) provide quality music education to young children through a collective of teachers that follow their comprehensive program. Our goals were to increase the amount of teachers under the MYC umbrella and attract new parent subscriptions. We created a parent/teacher portal that including a new Find a Teacher feature. This was a key component for new and returning parents that would allow them to search and contact teachers in their area — making the registration process much quicker and easier. Each new user would get access to the MYC portal through the website and mobile app. Both the needs of parents and teachers needed to be addressed in the portal while keeping development efforts minimal to hit our scheduled deadline. The user interface was designed using reusable components and layout templates that could be easily modified to fit each user type’s need. Our portal dashboard kept the same responsive layout for both teachers and parents but displayed key information for each. We used this approach for the entire website and app structure. 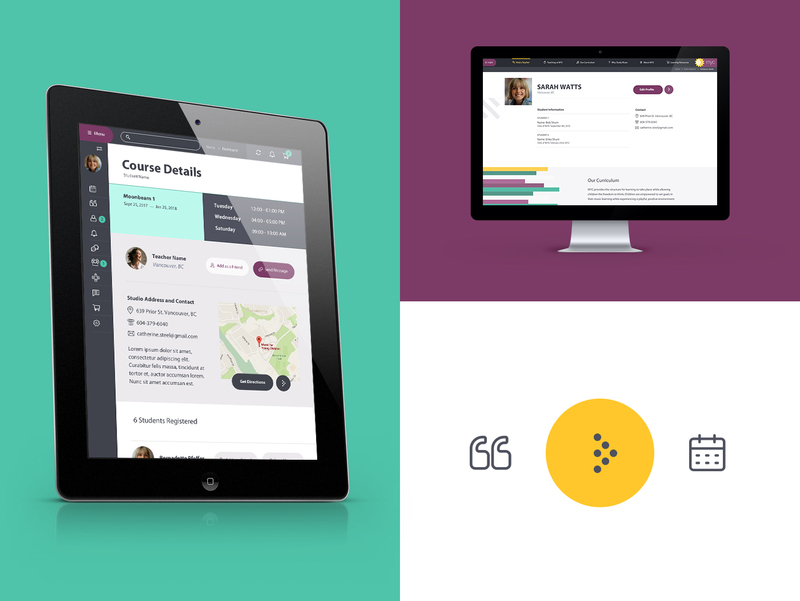 Each teacher had their own public profile page to help users choose and book a new course. This was easily editable by the teachers so they could put their own description and price along with specific details around the courses they offer and the space they teach in. 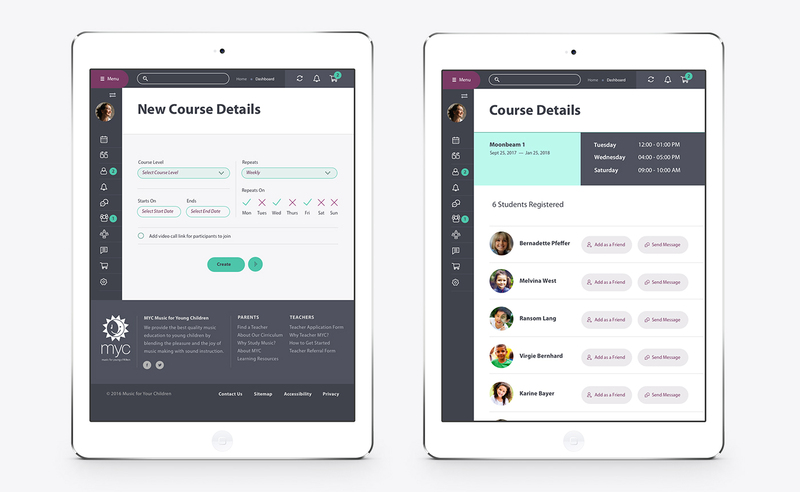 Through the portal, teachers were able to easily create a new course or manage their current ongoing programs. 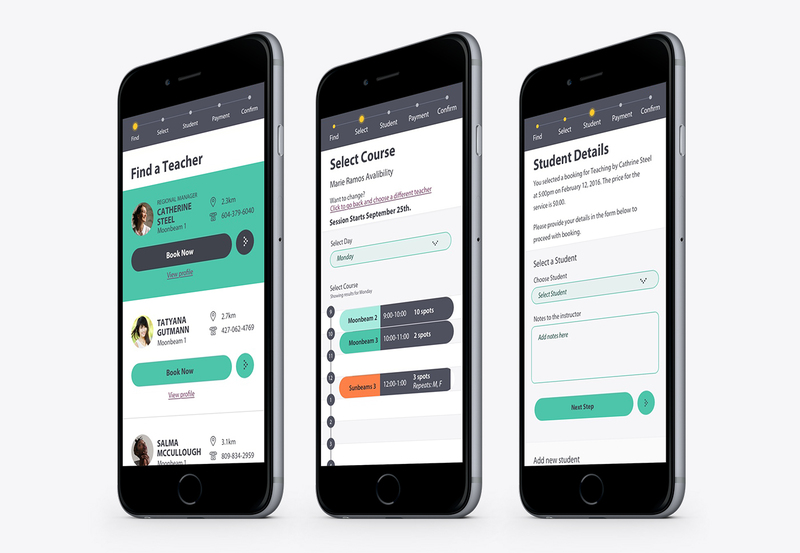 The parent portal became an integral tool in fostering and retaining users; giving quicker access to see the schedules for any ongoing courses, allowing multiple children under one parent account and making teachers and course information more accessible. The new brand was created with a new generation of parents in mind. 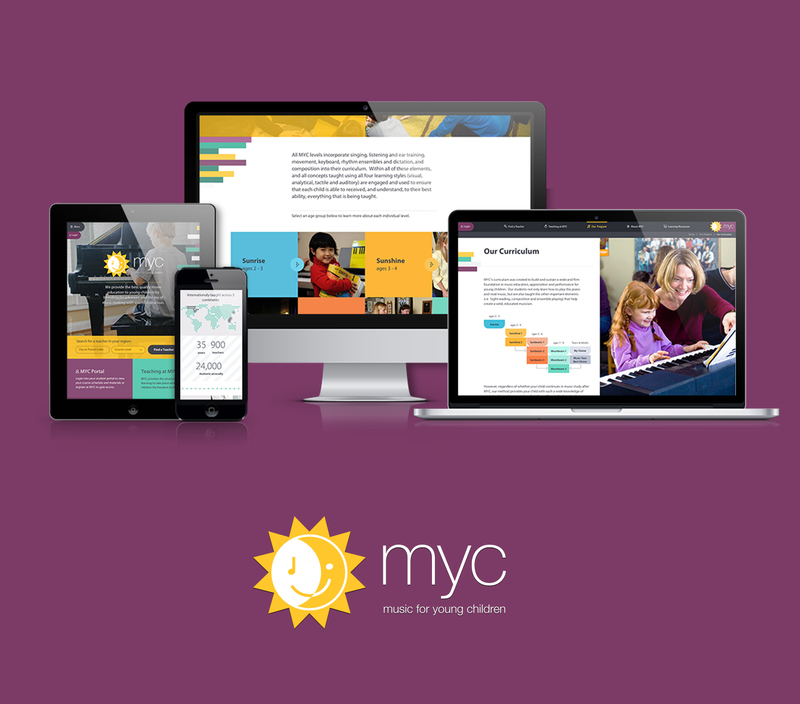 Focusing on clean and easily digestible information, the new identity needed to show off the family fun MYC flavour. The colours and elements were inspired by the balance of structure and freedom within music. Music is very mathematical with order and structure but there’s also a lot of freedom and spontaneity involved on the creative side. Another key component of the MYC program is that all of the foundation lessons are taught on the piano. The result was creating a pattern of rectangle bars all the same height but varying lengths and colours — blending piano keys, structure and freedom. 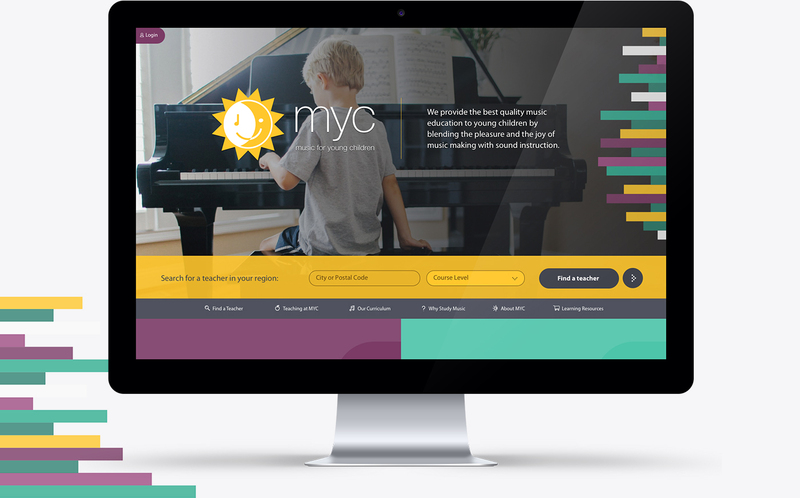 Throughout the website and app, the style made use of large imagery and light rounded icons to showcase the fun atmosphere of an MYC lesson. To contrast with the rectangles, all buttons and links on the website and app used circles and lozenges as clear call to action items. 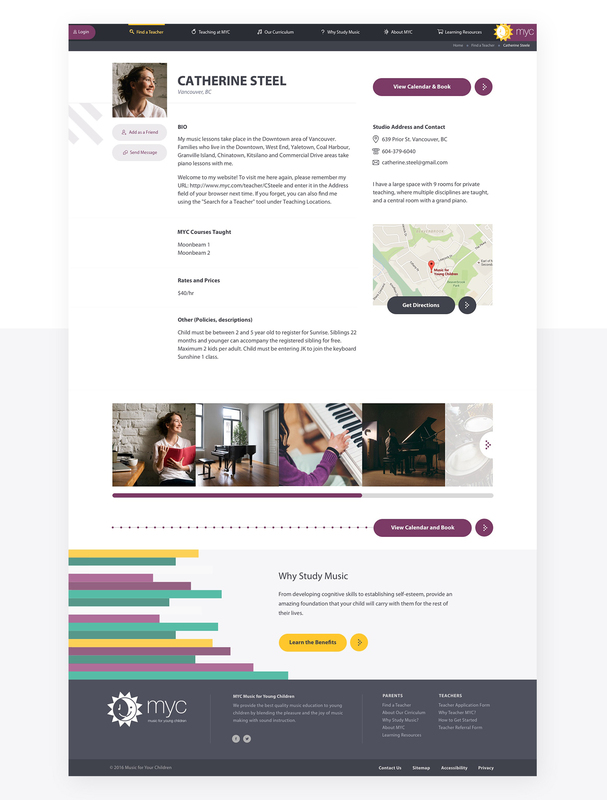 The pages used the brand’s colours and shapes through a series of re-usable component blocks for content sections and call to actions making it efficient for the development team. Check out a website for the Student's on Ice Foundation here.